A project undertaken to boost my electrical engineering understanding during free time (during charges) at Curtis during the summer of 2001 (High School). 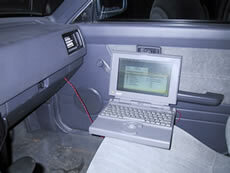 The project was to build an adapter that allows me to run my old PowerBook 140 (1991) in my car off the car battery. The cars battery ranges from 11-15V while the laptop requires 7.5V. This means that some type of voltage regulation would be needed to always output 7.5V. After looking for ideas online and talking to people, I was certain I was going to use a LM317, a integrated circuit (IC) designed for voltage regulation. It also happened that Curtis had some LM317s that I could use. Then I looked around for information regarding the LM317 and found a very useful site that not only provided excellent information on how to use the IC, but also supplied a schematic for several different applications. I then collected the appropriate capacitors, resistors, etc. The resistor values that program the LM317 are determined through a formula: Vout = 1.25 x (1+(R2/R1)). R1 had to be about 120 ohms to give the LM317 enough current to operate (assuming a 12V car battery, 10 mA would power the IC). The above schematic was provided. I removed the circuit relating to an AC power source, including the 22000 µF capacitor. After about 2 hours of on and off work, it was complete. I also had to by a M-type adapter plug from Radio Shack. I tested it off of a 0-32V/0-2.5A power supply at my desk and it regulated correctly to 7.5V. I then turned off the power supply, and hooked up the laptop. However, before I could turn on the power, one of the components started to smoke. I quickly disconnected the cord and checked the circuit. Nothing appeared to be blown and I tested it back on the power supply, without the laptop attached, and verified it still worked. I then realized that the voltage produced by the laptop's battery had put a reverse current on some of the components and had created a short circuit. I then removed the laptop's battery and tried again. The screen came on, then the mouse cursor, then dead. By watching the current drained by the computer, a good 2A when the hard drive span up, I determined it was passing the max amperage the LM317 was rated for. This was disappointing. I was using the LM317T, which was rated at 1.5A. There was a model K rated at 2.2A, but Curtis didn't have any. Time for a redesign. Once again ignoring the AC circuitry, I started construction on version 2, a much more advanced unit that used a pass transistor to share some of the current. This unit's construction was slower, took the course of a week. This one was much neater and sported a nice heat sink for the pass transistor to mount on. Unfortunately, Curtis didn't have any of the particular transistors required, but a work around was drawn up that used a NPN rather than a PNP power transistor. After a few annoying problems due to bad connections and a broken wire, things were finally looking like it would work. When reviewing the design with a co-worker, the NPN workaround was discovered not to work. Back to Radio Shack to get the right part, and luckily one PNP transistor beefy enough was left in stock! A few days later the unit ready. After some testing on various resistors, the unit was getting very hot. The LM317T was reaching 80°C+ at 2A!! A new, bigger heat sink was needed. I found a nice one and rigged it up, and was ready to fire up the laptop. Darn, more problems. It appeared that the PNP transistors emitter and collector were shorted. 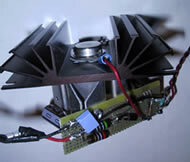 The PNP was in a TO3 package so the whole heat sink became the collector. When screwing everything in, the emitter wire's insulation was pierced by the corners of holes I had drilled in the heat sink to mount it. This took considerable time to figure out and then fix, and basically resulted in using a lot of electrical tape to resist the parching. Eventually all looked well, and fired up the unit with the new heat sink It now ran much cooler and I was prepared to try with the laptop. I plugged it in to laptop (with the battery out) and fired it up. Watching the amperage on the supply's analog display, I saw the cursed 2A spike, and then it dropped to a nice 1A for the rest of the test. 1A is considerably less that what I had expected and was very pleased. Now everything would run even cooler! 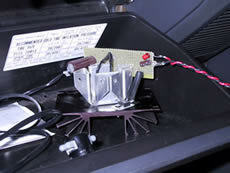 I then soldered on the cigarette lighter attachment and when I left Curtis that day, I tried it in my car. All I could say was "cool" when the screen booted up and I started typing in Word.